Law enforcement detain people suspected of illegally crossing the U.S.-Mexican border by traveling on a smuggling boat and landing ashore in Palos Verdes on Monday, Dec. 10, 2012. Two Mexican nationals accused of ferrying people from the U.S.-Mexico border in a boat that was involved in a collision that left a Coast Guardsman dead pleaded not guilty during a court hearing on Friday. Federal and local authorities detained 25 people suspected of illegally crossing the border by traveling on a smuggling boat, known as a panga, that was found off the coast of the Palos Verdes Peninsula. Angie Crouch reports for the NBC4 News at Noon on Monday, Dec. 10, 2012. The Marina del Rey-based Guardsman was thrown into the ocean when the search boat he was aboard was rammed by a Mexican fishing boat known as a panga near the Channel Islands. The men were charged in a suspected human smuggling conspiracy on Dec. 12. The case drew headlines when 23 people were found wet and caked with sand after getting off a boat that landed near a seaside gated equestrian community in Palos Verdes. More than two dozen people were detained in a human smuggling bust off the coast Monday. 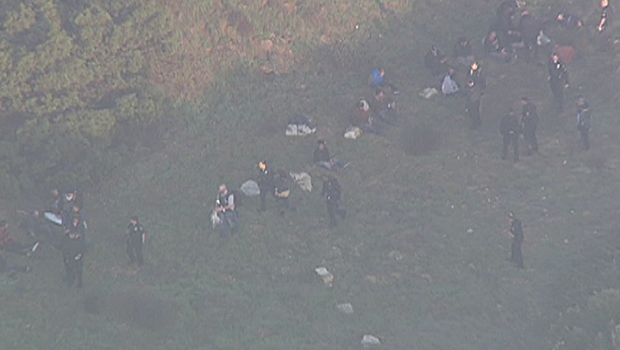 Federal agents made the discovery in a routine patrol Monday morning near Portuguese Bend Beach in Rancho Palos Verdes. Resident Tom Redfield said one member of the group ran into his backyard and asked for help. Angie Crouch reports from Rancho Palos Verdes for the NBC4 News at 5 p.m. on Dec. 10, 2012. Some of the people detained after getting off a 27-foot fishing told Homeland Security agents they or their families had agreed to pay as much as $10,000 to be smuggled from Mexico to Southern California via the Pacific Ocean beginning on Dec. 10. From there, those being smuggled were planning to fan out across the state and country to reunite with family members, some of whom were naturalized U.S. residents, court documents said. Those aboard told agents about a harrowing trip. One woman told agents that during the trip she heard the smugglers arguing and threatening to dump one of the passengers into the water because he they said he was too fat, court records said. The men are expected to appear in court again on Jan. 7.